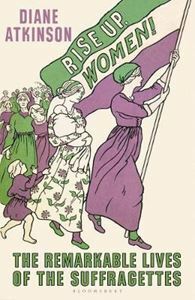 Led by Emmeline Pankhurst and her daughters Christabel and Sylvia, the suffragettes and their actions would come to define protest movements for generations to come. From their marches on Parliament and 10 Downing Street, to the selling of their paper, Votes for Women, through to the more militant activities of the Women's Social and Political Union, whose slogan `Deeds Not Words!' resided over bombed pillar-boxes, acts of arson and the slashing of great works of art, the women who participated in the movement endured police brutality, assault, imprisonment and force-feeding, all in the relentless pursuit of one goal: the right to vote. A hundred years on, Diane Atkinson celebrates the lives of the women who answered the call to `Rise Up'; a richly diverse group that spanned the divides of class and country, women of all ages who were determined to fight for what had been so long denied. Actresses to mill-workers, teachers to doctors, seamstresses to scientists, clerks, boot-makers and sweated workers, Irish, Welsh, Scottish and English; a wealth of women's lives are brought together for the first time, in this meticulously researched, vividly rendered and truly defining biography of a movement.